One person lost his home after a major health insurer potentially disclosed the HIV status of 12,000 customers. Aetna sent letters on July 28 to 12,000 customers who are taking medication to treat HIV or for PrEP. The envelopes had plastic windows to show the name and address of the customer, but the windows also revealed part of the first paragraph of the letter. The words “Aetna health plan when filling prescriptions for HIV Medic-” are clearly visible without opening the envelope. “I know of someone who has been kicked out of his home because somebody who saw his envelope learned his HIV status,” said the Legal Action Center’s legal director Sally Friedman. 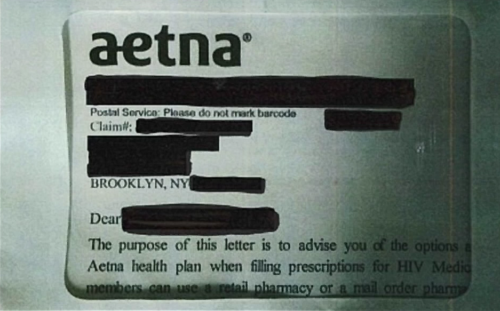 Aetna sent a letter to the affected customers blaming a vendor for using the window envelope and admitted that “in some cases” the letters shifted so that the information was visible. Twenty-three complaints about the letters have been made so far, and more are expected. The AIDS Law Project of Pennsylvania and the Legal Action Center sent a cease and desist letter to Aetna. The letter says that the insurer potentially violated the Health Insurance Portability and Accountability Act (HIPAA), which, among other things, protects the privacy of patients’ medical information. The letter also asks what Aetna is doing to prevent similar situations in the future. “It creates a tangible risk of violence, discrimination and other trauma,” AIDS Law Project of Pennsylvania executive director Ronda Goldfein said. The organizations expect more customers to come forward with complaints and are considering further legal action.